The Carnegie Building, located on the Southwest corner of 10th and Chestnut Streets (604 S 10th St.) did not open until October 28, 1908. During the three years of planning and construction of the new library, the branch occupied three rooms of a private residence at 1125 West Chestnut Street, in the heart of Louisville’s mainly black neighborhood. When the Louisville Western Branch Library was close to opening, Thomas Fountain Blue was chosen as the branch librarian. Blue received an education at the Virginia Union University as a theologian, but he was asked to run the new library. Blue, the first African American to head a public library in the United States, upon assuming the post immediately created a community outreach strategy. He said the library was much more than a place to store books. “With its reading and study rooms, its lecture and classrooms,” according to the branch librarian, “it forms a center from which radiate many influences for general betterment. The people feel that the library belongs to them, and that it may be used for anything that makes for their welfare.” Many older pictures of library patrons show them dressed in their finest clothing (their Sunday best) because they understood the importance of the knowledge held in that building, and they wanted to show their respect for the longstanding black tradition of high regard for education. The Louisville Western Branch Library became a place of community. 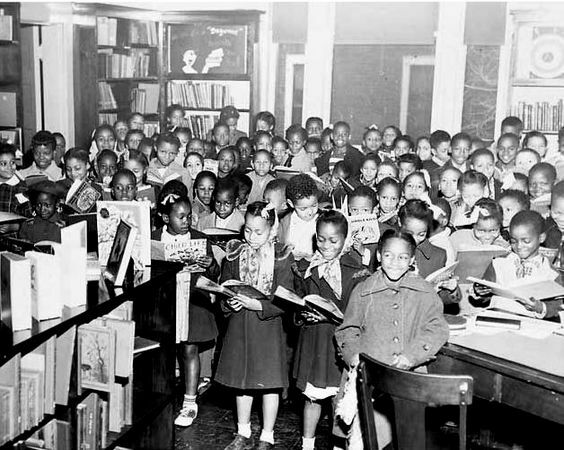 The library included a Children’s Department, which developed story time, debates, and special events to help the intellectual development of Louisville’s black children. Each year, Joseph S. Cotter, a local black educator, sponsored a children’s spelling bee with Cup winners and cash rewards. The prominent Douglass Debate Club for high school boys, which argued civil rights topics, studied and cooperated with this branch. In 2001 the recording artist Prince made a secret donation of $12,000 to the LFPL (Louisville Free Public Library) in support of the Western branch, which at that time was under the threat of closing. The branch survived and now serves as a home for the African American Archives, featuring resources dedicated to African American History in the Louisville area, across Kentucky, and the nation. Joan Potter, African American Firsts Famous, Little-Known and Unsung Triumphs of Blacks in America (Kensington Publishing Corporation, 2009); “Western Library,” http://www.lfpl.org/branches/western.htm; “A Separate Frame,” http://www.lfpl.org/western/htms/sepflame.htm; “Prince made secret donation support Louisville’s historic Western Branch Library in 2001,” https://insiderlouisville.com/lifestyle_culture/music/prince-may-have-helped-save-louisville-library-from-closure/; “Louisville library holds important place in history,” http://www.wave3.com/story/23963328/louisville-library-holds-important-place-in-history.